Now that you have defined the start and the end points, it is time for you to make a list of all the possible blocking questions your users might have intermittently. One thing you need to realize for nurturing audience in online space is that, the attention span in online work is very less. You cannot ask your users to take a big step forward in a simple communication. There, you should try to break down the questions appropriately and try to address each question individually. In most of the cases these blocking question will be related to “Awareness, Consideration and Preference stage in the marketing funnel. 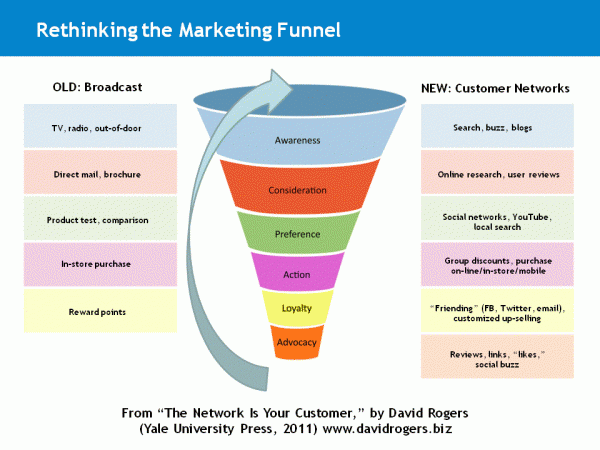 The Marketing Funnel is based on the Psychological “hierarchy of effects” theory dating to the early 20th Century, plots marketing as a sequence of psychological states in the mind of a the customer: from Awareness (of the product category) to Consideration (thinking about a purchase), to Preference (for a specific model or brand), to Action (making the actual purchase). Why should I learn Digital Marketing? Why should Traditional Marketers learn Digital Marketing? Why should entrepreneurs learn Digital Marketing? Why should Digital Marketers continue to learn Digital Marketing forever? Why should I prefer live online classes, when I can attend classroom trainings? Should I hire someone with Digital Marketing Skills or learn it on my own? Am I skilled enough to learn Digital Marketing? I am already an expert, how can a training program help me? Why should I spend 6 months in learning Digital Marketing? Why should I take Digital Vidya’s course, why not DSIM or Simplilearn or Edureka or Edupristise? Note: Do copy the information related to blocking questions in a doc file separately. You will need that in later steps as well.